It is done. David and David sing their final songs before the audience decide who wins the crown. Both contenders will battle it out in 3 rounds. The first round were songs chosen by music legend, Clive Davis. In the second, the contenders were made to choose songs from the top 10 American Idol Song Writer Finalists while the last round gives them the freedom to choose the best song that would prove they deserve the title. Clive Davis chose U2’s “I Still Haven’t Found What I’m Looking For” for Cook and Elton John’s “Don’t Let the Sun Go Down On Me” for Archuleta. The judges found both performances satisfactory, but Simon, as expected, responsibly provided the needed edge that Randy and Paula could not deliver, by declaring that the round belonged to Archuleta. Cook chose a fast song entitled “Dream Big” while Archuleta went for “In This Moment.” Judges hinted that Cook’s choice wasn’t the best, though his performance made up for the wrong choice. 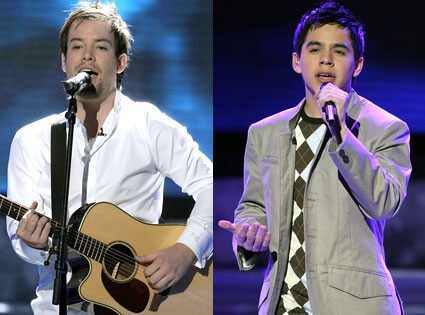 Again, Simon declared the second round in favor of Archuleta. The final round gave both contenders the choice to sing the best song they have ever performed, including any song they might have already performed during the competition.Â Cook was in character when he chose to take a risk and performed a new song, The World I Know.Â The song obviously meant something to Cook when he concluded the song in tears.Â Randy and Paula gave kind reviews.Â In contrast, Simon told him it was the wrong choice despite the tears.Â He even suggested that a repeat performance of Billie Jean would have been the better alternative. Playing it safe, the young Archuleta opted to repeat his best performance and sung Imagine.Â His repeat performance got raves from the judges, almost as if declaring him the winner regardless of the final tally on the votes tomorrow.Â Tomorrow, we will find out how much clout the judges’ opinion will have on the voting audience.